Hi, I hope you are well and had a fantastic weekend. For those, like me that like to know everything about new gadgets and new cameras, you may know that last week Nikon announced the new D7500. In paper it sounds great, but is it worth it? Since I moved to DSLR system cameras, I have been shooting with Nikon, so it makes sense to me to share my opinion about the new D7500. For those who don’t know I am a photographer that photographs mostly events and ceremonies, so fast glass is a must, but what about cameras?What do I look for in a camera? My main camera is a Nikon d800 and not only is fantastic at high ISO, but overall it performs really well.My second body at the moment is the Nikon D7100 and I love it too, so in paper it would make sense for me to upgrade, but will I upgrade? The anwser is NO! I will tell you why. As I mentioned above, I need cameras that will perform well under all light conditions and the D800 does the job, but while photographing an event or a ceremony, I always carry 2 bodies, in my case the D800 with a 24/70mm 2.8 and on my D7100 a 70/200mm 2.8. So even on the “crop sensor” camera it still needs to perform well, and to be honest, using fast glass with my D7100, I am very pleased with the results. The new D7500 sounds amazing as the ISO can go up to over a million, but first, the results (based on her big brother D500) the quality is not all that at that high ISO and to be fair I’ve shot events where the only light sources were only candles, and I got all the shots I wanted/needed at just over 25000 ISO, so for that, in my opinion its not worth the upgrade just based on ISO. Another great feature on the new D7500 is that it allows to shoot 50 Raw images in a single buffer at 8 fps, as the D7100 does 6fps and 7fps at “crop mode” for my main workflow, even that after 2 seconds the buffer is full, my D7100 still performs really well under normal conditions. The future is here and the video resolution is getting better and better and on the D7500 you can shoot 4K video and to be honest I never tried 4K video on a Dslr, but as I don’t do video, even that is great to shoot at 4K, for me just upgrading so I can shoot 4K it just doens’t make any financial sense. Another great improvement on the 7000 series is the tilt screen, specially if you shoot landscapes or above a crowd, even that personally I think its a great feature and it can be super helpful, in my opinion its not great for me. With the revolution of Social Media, everyone takes a photo and wants to share with friends, family and followers, for that Nikon incorporated Snapbridge, so you can easily transfer the images to your mobile device, but as for me, I rather take some photos, get into my computer and add them to my Lightroom, syncronized with my phone, its just fantastic! Now here is what I think that Nikon messed up big time, so even if I was thinking about upgrading to all those new cool features, this just put me off! Well, If I am photographing a ceremony or an event I always shoot to 2 memory cards, so if for some reason one memory card fails, I have the other one.I only had once that a memory card failed on me, and funny enough, it was a brand new (cheap, but from a well know manufacturer) card that I bought to have more storage while on holidays that after 2 test shots it just failed. So, for my work shooting with 2 memory cards, it just makes sense. By now, you already know that I am not going to upgrade, if there was 2 memory card slots, I think I would upgrade as the extra frames per second, could be cool to shoot some wildlife or even sports. It may not make sense to me to upgrade, but if you are after a great camera to shoot wildlife and sports, having 8fps is a great feature to have without spending the money on a D500. Also, if you have a 3000 series camera and are looking to upgrade to a fantastic camera, the D7500 is the way to go, but you can also buy a 5000 series camera where you have the tilt screen and with just over 3 extra megapixels and with the money you save, buy some sharp glass. By all means, I am not trying to put you off of making the purchase of the D7500! Its a fantastic camera, well built and has many cool features, its just of matter, is it worth £1299.00? ( Body only). I hope this post helped you in either making the decision of buying or not the D7500. I hope you had a fantastic weekend. a few weeks ago I was having a chat with a friend about still life photography and he actually mentioned that he wanted to create an image where the glass would be half full, so the liquid would be on the top and the bottom half would look like it was empty. Straight away I had an idea! Of course I didn’t tell him about what I had in mind as I wasn’t sure if it would work, but here it goes. Many years ago I remember old people saying that olive oil was lighter than water, and I remember that my grand mother used to use olive oil with candles… So I decided to have a go! All I did was half fill the first half of the glass with water, then I grabed some olive oil and slowlly I was pouring to the same glass. Guess what, it was kind of working, so I decided to let it settle for half an hour or so. And as you can see it worked! The olive oil stayed above the water without mixing with it. So, as I had achieved what I was after I decided to create and image where I had an Empty Glass, another Half Empty and other Half Full. I think that I might do another version of the image, but to be honest, it worked. So, sometimes even if something may sound impossible, it is possible to create and this image is proof of it! So, now that you know one of my tricks, experiment and play! I am sure you will come up wit some great results. I hope this post helps you and inspires you in any way! Hi, I hope you had a fantastic weekend. Sometimes when traveling or even just going for a walk we encounter lots of problems, its either harsh shadows, no detail on the shadows and a very common (not if like me you live in London), a true blue sky, with not even a cloud to add interest to the sky. Fair enough, you have a great subject and you created the perfect composition, but with a plain blue sky, its like something is missing. But there is a super easy way to fix that! No, I am not talking about replacing the sky. Well, instead of replacing the sky, why not add a cloud or two? In Photoshop not only is very easy, but also creating a brush, you can actually use it over and over again in different images, so bellow you find a video tutorial where I show you exactly how to do it. I hope it helps with your own images. Today I would like to talk to you about 360 degrees panoramas. But even that either using a phone or a proper 360 camera it looks cool, its never as great as doing it using a dslr, as dslr’s are not only sharper, but also the fact you shoot raw, you have a lot more to work with. So I created a tutorial where I can show you a way to go around the situation so that you can use your dslr to photograph the panorama and with the help of Photoshop you can actually trick Facebook to think that you used a 360 camera. All is good, but what about Instagram? Everyone likes Instagram, but it won’t allow you do upload a 360 panorama. So I came up with an idea, instead of a panorama, why not upload a video that will give you the feel of the 360 panorama. I hope this post and videos will help you. If you have any questions, feel free to contact me and I will do my very best to help you. Hi, I hope you had a fantastic weekend! Today I would like to point out the importance of shooting in Raw. I get people saying that the jpeg looks better than a raw file, a raw file is just plain raw, therefore, it will never look like a jpeg, so even if you shoot raw, the camera will show you a jpeg preview of the image, so when you take the image to a computer it will look flat. But it can easily be fixed. The very basic processing on a raw file is the white balance, the contrast and sharpeness. Ok, fair enough, when you start processing an image, we always do more than that, but because its a raw file, it has lots of information, so, with more information, means a lot more control, not only to your image, but also how creative you want to be. Bellow there is a link of a video I did a couple of weeks ago, where I process a raw file and turn a boring image to an awesome image. I hope this helps you realize that shooting raw is not scary and its actually the way to go. Last year or so, I waspaying around in the studio with a bottle and some glasses, but everything I was doing, even that it was cool, it was vulgar, the sort of images that you Google and you find hundreds of similar results. 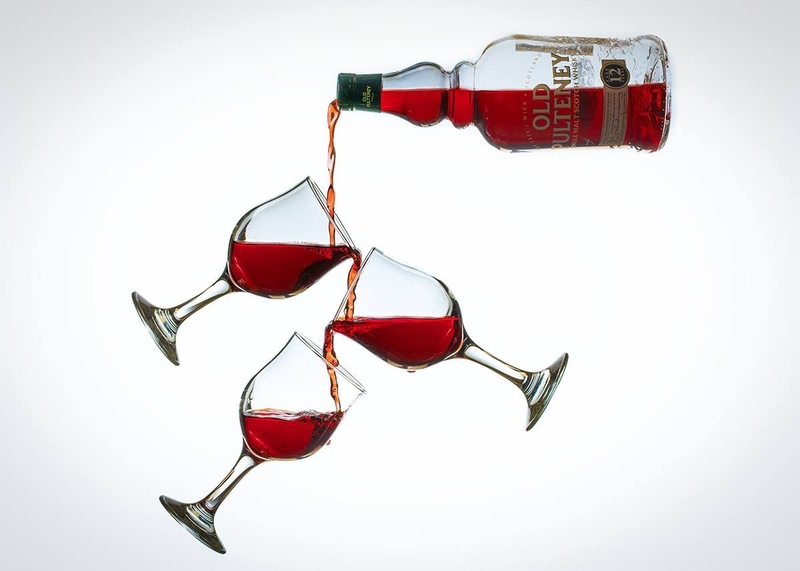 So I thought about doing something different, a bottle pouring some “whisky” to some glasses, but with a twist. I wanted the bottle floating ans so the glasses, so I started planning. Grabed some electrical tape and taped the glasses to a couple of tripods and startedpouring the drink. By the way, I used ice tea instead of whisky, it looks the same but its cheaper and to be honest it would be a waste of some good whisky. Also, I did a tutorial where I show you how I created the image. I hope it helps you and inspires you. Hi everyone, I hope you had a fantastic weekend. Its all about creating frames formyour images using Photoshop. I hope,you enjoy the tutorial.